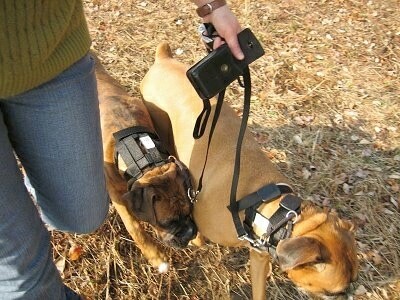 Owning two Boxers that go on regular walks, I am always keeping my eye open for anything that will make our walks more enjoyable. The proper way to walk a dog is to keep the dog walking beside or behind you, with slack on the lead. No tension; your dog should not be pulling you. In order to successfully accomplish this, it is recommended you keep the leash/collar high up on the neck, giving you more control. This is what dog show handlers do, and there is a very good reason for it; it works. I have tried several methods. 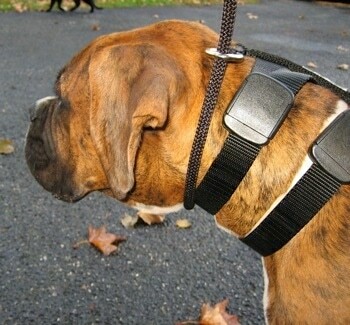 A choke collar. 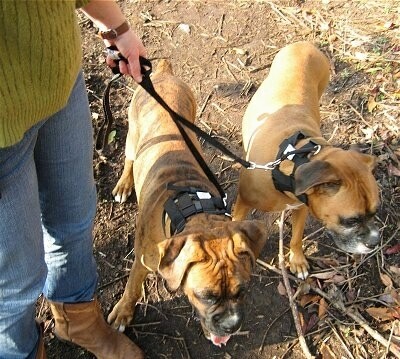 However, when you reach your goal of walking without the dog pulling, the choke collar falls down to the base of the dog’s neck, which is the strongest part of the neck. 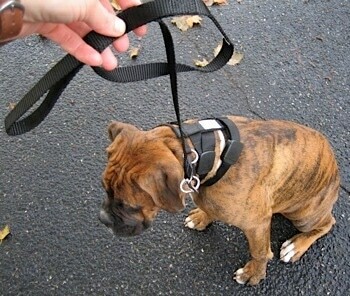 Therefore, if the dog starts to pull, it's difficult to correct him properly with a short tug on the lead. 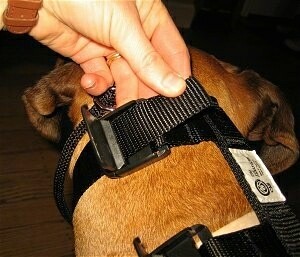 It is also cruel to use this collar if you are not going to teach the dog not to pull. 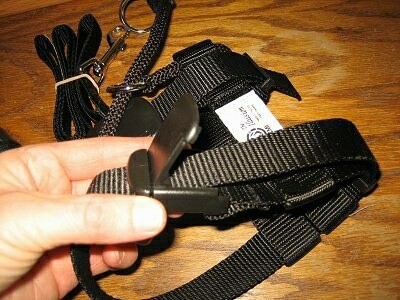 The collar is meant to give a correction for pulling, not to always be choking the dog. This also applies to a prong collar. 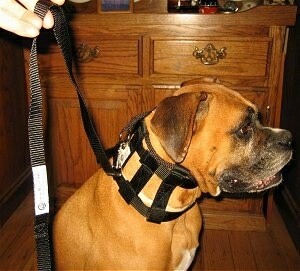 I have also tried turning the leash around and looping it around the neck. Same deal, it falls down as you walk and you are constantly finding yourself having to adjust it. 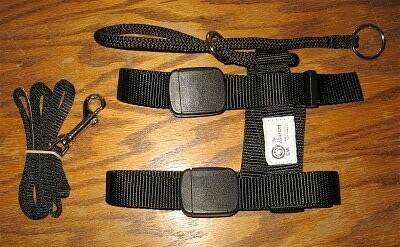 I decided to try the Illusion Dog Training Collar, which was designed by Cesar Millan's ex-wife, Illusion. 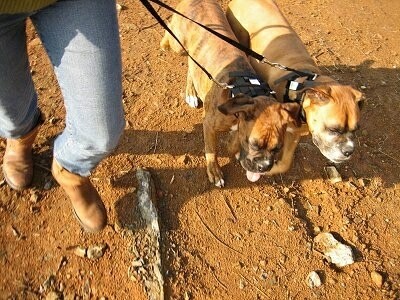 I immediately noticed a difference in the way my dogs walked. This is what it looks like right out of the bag. 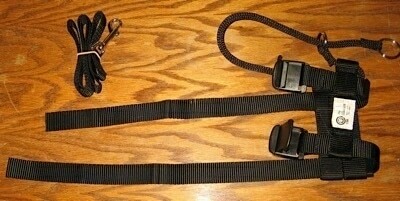 It comes with a small lead that clips to the collar, which I find to be the perfect size. 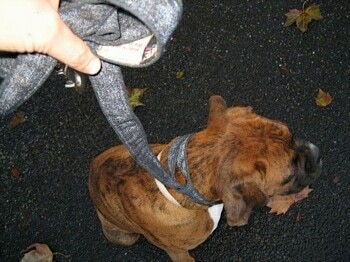 Two straps go around the dog's neck, which keeps the top rope in position. It's this upper rope which you are actually using to lead the dog. This is what it looks like when the collar is on correctly. We're all ready to go out for our walk! I noticed a big difference in the way my Boxers walked. They responded very well to the collar. It was very easy to correct them with a short tug. 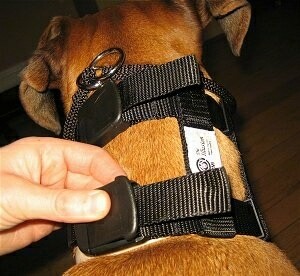 The purpose of this collar is to walk with no tension on the lead. 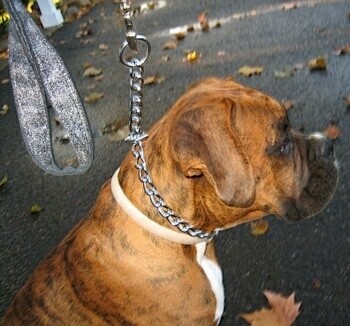 The design of the collar simply keeps the collar up high on the neck, instead of down near the shoulders, which is the strongest point on a dog. 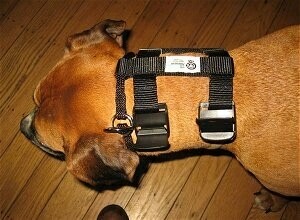 If you are going to use this collar you must make sure your dog heels. Allowing a dog to pull in front while on a walk is not recommended, as it reinforces to a dog that he is YOUR pack leader. If you are one of those people who do not plan on teaching your dog to heel and are going to allow it to pull while on a walk, this collar is not for you. Note: this collar is not recommended for dogs whose necks measure less than 13 inches at the base, or weigh less than 18 lbs. Dogs with any breathing problems, such as "pushed-in faces" that restrict breathing; dogs with trachea or throat problems, such as Pomeranians; and dogs with elongated, overly slender necks, such as Greyhounds, should NOT use the collar. 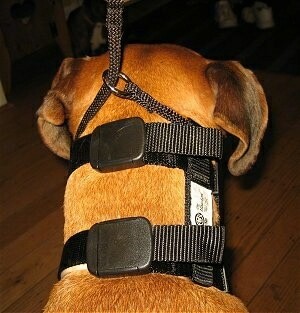 The collar was also not intended for dogs under the age of one.